Advanced Hair Fibres rebuild your hair with natural Keratin fibres creating the appearance of thicker hair in an instant! The Thickening Fibres blend in and electrostatically bond with your existing hair, dramatically building up hair volume and minimising the appearance of thinning hair. Keratin is a protein that is a major part of our hair, nails and skin. Hair especially is made of proteins that are associated with Keratin. Keratin is utilised in the internal structural protein in the cortex, or inner core of the hair, as well as in the cuticle, or outer layers of the hair. When hair is damaged, Keratin is depleted, which exposes the cortex by weakening the cuticle. By replenishing Keratin, the hair shaft gets stronger again and allows it to resist the various pressures that cause thinning. As you apply the Thickening Fibres to your scalp, you will see balding patches and thinning hair simply disappear. Once you have completed applying the Thickening Fibres, you simply brush through your hair and the fibres blend with your existing hair in a completely undetectable manner. Advanced Hair Fibres are a unique complex of organic Keratin protein, similar to your own naturally growing hair. They’re precision laser-cut into micro-sized fibres and are a completely safe and natural solution for both men and women. No matter what the weather conditions, be it strong winds or even rain, the micro-composition of the Thickening Fibres ensures they stay bonded to your existing hair. When you do wish to remove them, just wash them out with shampoo. Who Is Suitable for Advanced Hair Fibres? Anyone suffering from balding or thinning hair, or wanting thicker looking hair, can instantly alter their appearance with Thickening Fibres. 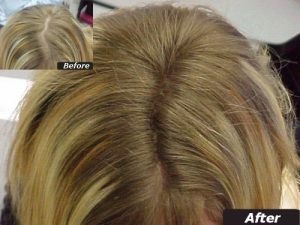 The Advanced Hair Thickening Fibres are an excellent non-surgical, completely safe application to be used in conjunction with Advanced Laser Therapy or AHS-FP programs. Thickening Fibres are totally safe to use with Advanced Hair Regrowth Formula, just ensure the formula has completely dried before applying Thickening Fibres. To purchase your Advanced Hair Thickening Fibres – inquire at your closest participating Advanced Hair Studio. Our Advanced Hair Fibres treatment offers a leading hair thinning treatment. Over 500,000 people around the world have stopped or improved their hair loss with our scientifically-tested and medically-developed hair loss products. 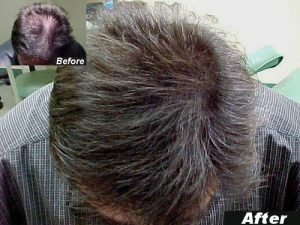 Imagine watching your bald patches disappear, and your thinning hair restored to its former thickness and health right in front of your eyes. It’s an incredible experience, and if you’re tired of styling your hair to accommodate the thinning, wearing hats or feeling old and passed your prime, you need to visit us for hair fibre building treatment today. You have nothing to lose and everything to gain, and the best part is, the results are instant!